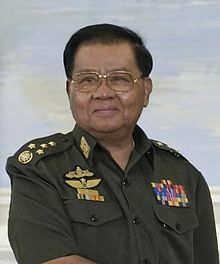 Senior General Than Shwe (Burmese: သန်းရွှေ; pronounced: [θáɴ ʃwè]; born 2 February 1933) is a Burmese strongman politician. He was the head of state of Burma from 1992 to 2011 as Chairman of the State Peace and Development Council (SPDC). In March 2011 he officially stepped down as head of state in favour of his hand-picked successor, Thein Sein, and as head of the Armed Forces, being replaced by general Min Aung Hlaing. Shwe is suffering from diabetes and he is rumored to have colorectal cancer. ↑ "Than Shwe Watch". Irrawaddy.org. 2009-03-10. Retrieved 2011-03-13. This page was last changed on 30 March 2018, at 23:07.